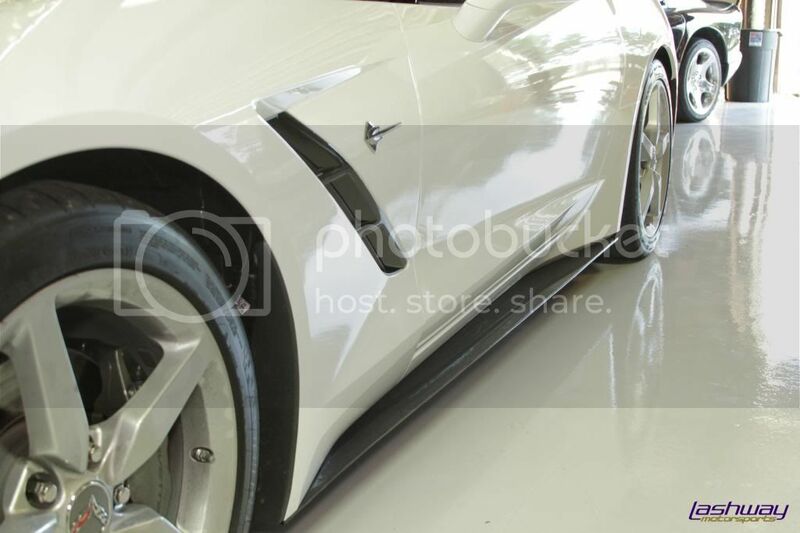 Some production footage of the 2014 Chevy Corvette Stingray (C7) at the Corvette Assembly Plant in Bowling Green, KY.
Lashway Motorsports announces their first carbon Fiber exterior parts exclusively for the Stringray Corvette. They have developed custom one off parts for the C7 (all trim levels) out of 100% real Carbon Fiber. These parts are entirely made in the USA as well. The first PROTOTYPE to be released are set of side skirts. Two styles will be available. Vossen reveals their C7 Corvette Stingray in a HD video. Edmunds has taken delivery of their C7 Corvette long-term tester and has made their introductory post. Listen to the Chevrolet Corvette Stingray engine music [VIDEO]. Patrick Herrmann, Technical Manager Communications at Chevrolet Europe, tested the new exhaust system of the Corvette Stingray. For this occasion, he compared it to a very special Harley Davidson motorbike with a Jekill & Hyde exhaust. The Corvette Stingray system adjusts the timing of the electronically controlled exhaust valves to enhance audible feedback from the V-8, depending on the drive mode. How’s this for being recognized as an icon! The C7 Corvette has been made into a new monopoly game piece for a new version of the game called Monopoly Empire. Lashway Motorsports has begun initial nitrous testing on the C7. Check out the video inside for a look at 100 Wet Shot – 90* air – 80% humidity with a stock engine and drivetrain. Get inside the new Corvette stingray and take a lap around Virginia International Raceway with Corvette Racing’s Tommy Milner [VIDEO]. Several C7 Corvettes showed up at the recent Houston Coffee and Cars event. Video after the jump.